Burnham Copse Primary School in Hampshire has a higher than average proportion of children with SEND (27% in Sept 2016). The school’s SENCo used Sleuth in a previous post and knew how effective it was for behaviour management so wanted to introduce it at Burnham Copse in particular to monitor the behaviour of pupils with SEND and evaluate how to provide effective support. A key objective for Sleuth was to develop a more proactive approach to behaviour management by accurately and consistently recording details for behaviour incidents that would permit frequent and detailed analysis. With the flexibility and ease of data analysis in Sleuth, staff can quickly identify patterns in behaviour, have information to investigate potential root causes of certain behaviours and have evidence of the impact of certain consequences and interventions. The impact of an exclusion room at break time as a consequence for behaviour was one particular aspect of the behaviour policy that the school were keen to evaluate. Was there evidence that this was effective in modifying the behaviour of children, including those with SEND? What alternatives could be used by staff when pupils were disrupting the learning of others? “We’re still only a couple of terms into using Sleuth but it’s going really well. It’s being used regularly and consistently which is fabulous, we’ve got lots of good data. I’m much more confident in the consistency of the data collection now because I’m looking at it routinely and can have real-time conversations with teachers to clarify what’s happened and ensure it is recorded accurately. “I’m now able to identify children that need support and we’re starting to put other things in place to try and help them improve, particularly for those that end up in exclusion regularly. We’re able to looking at alternative ways of dealing with that behaviour based on what Sleuth is telling us. 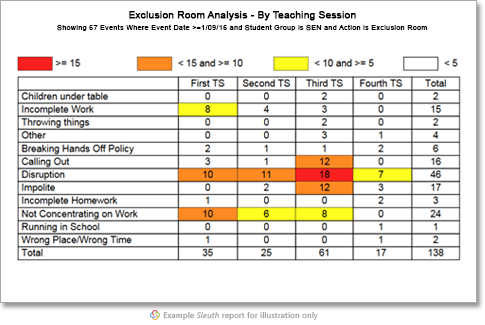 I can analyse exclusions and look at what behaviours are leading to children ending up in the exclusion room. Then we can plan the next step for those children. “Before Sleuth we weren’t analysing the reason why pupils end up in exclusion. There was an Excel register of children that were in the exclusion room and usually the head teacher would look at it at the end of each week and use it to call parents but there was no correlation from week to week. Not only has the recording process benefited from Sleuth but we can now analyse easily and be more proactive. It is already making a difference. 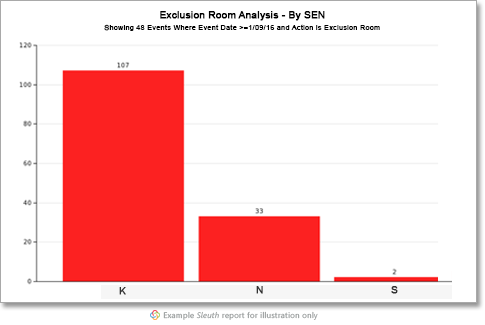 “One of the LSAs came to me and said she’d noticed two children in particular were being recorded as having been involved in quite a lot of incidents, she asked me, “What happens with the data?” So, I showed her Sleuth and the analysis and how to pull up reports based on visits to the exclusion room. She said, “Oh my goodness, that’s amazing … it’s really good to see how that data is being used.” Together with the class teacher we used that information to plan a different approach with a more immediate reward and consequence system for those two children which is meaningful and motivating for them, creating a visual reminder to go on their desk of what a good lesson and a bad lesson look like. If they achieve a good lesson there’s a 5 minute reward at the end of that lesson. We’ve just put that into practice now so it will be interesting to see its impact on the Sleuth data later on in the term. “Using Sleuth has led to some interesting conversations with pupils. I talked to one pupil who has been flagged up by Sleuth quite a lot and explained that teachers are now recording good behaviour and not so good behaviour. I explained that part of my job is keeping a track of the children’s behaviour and what’s happening in school so we can work out what’s going wrong and what we can do to change that. I said I’d noticed he was going into the exclusion room a lot and we spoke about what had happened and why and that led us to discuss that he was in control of his own actions. I told him that if he continues to end up in the exclusion room it indicates that it isn’t a consequence that is working, otherwise we wouldn’t see that behaviour again, so we may then have to find an alternative that is going work better. “I wouldn’t have been able to have that conversation without the information in Sleuth, I would have been relying on word of mouth and piecing together the conversations with different teachers. Those conversations are still important but Sleuth improves how we communicate things. “From the analysis I’ve done, there haven’t been any surprises in terms of the pupils involved, we know which children we see in exclusion and teachers know who they’re sending out of class a lot. But, what has been surprising, are the reasons why. Staff are really good at putting the details in Sleuth so we can see what’s happened in that moment and then over time we can identify the triggers and track whether it’s a certain time, lesson, or not accessing certain things. We’ve got the capacity to do that now.